TechSmith, the company behind Jing, recently added some new features that make the tool even more appealing. 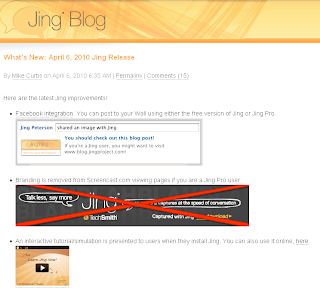 Both Jing (free) and Jing Pro ($14.95/year) captures can be posted to Facebook walls. Jing Pro users can now remove the Jing branding from screencast.com viewing pages. See these new features in action by viewing the interactive simulation on the Jing web site.